Wines are sensitive to external factors such as temperature, humidity, and light. Therefore the proper wine storage requires an environment where the climate conditions are monitored and exposure to light is kept at a minimum. When wine is under the right levels of temperature and humidity, they will mature accordingly. Wine cellars are the best location to store and age wines but not everyone has the financial ability to have one installed in their home. There are many other types of alternatives and wine storage solutions that can accommodate both small and large wine collections. Wine cooler cabinets can have the same options as a wine cellar only on a smaller scale. Wine cabinets are the best storage option because they combine all the essential features required to allow wines to develop and age fully. Wine cooler cabinets are designed to keep the temperature between 50 and 57 degrees Fahrenheit. These cabinets are also engineered to maintain the right amount of humidity to prevent the air from drying out the corks. Wine cabinets have ventilation systems that allow proper air circulation inside the storage compartments. Lack of ventilation can promote mold infestation and bacteria that can damage corks and wine labels. The presence of molds can also cause odor that can greatly affect the taste and flavor of wines. Another important feature of wine storage cabinets is that they provide wine bottles with the best protection against incandescent lights and are designed for quiet operation and little vibration. In order for wines to mature nicely, they need to be stored in a stable and calm environment. Wine cooler cabinets come in different designs and features that can accommodate various storage requirements and complement any interior décor. Most of the insulated wood cabinets look like furniture, and will blend well with the existing furniture in the room. Other important things that need to be considered when purchasing a wine cabinet are good insulation and well-sealed doors, interior lights and a retractable shelving system for ease of access. They are cooled by a unit that is similar to an air conditioner. 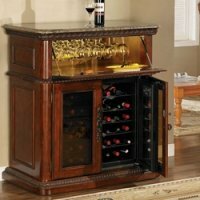 Wood wine cabinets will be an added attraction to any home.